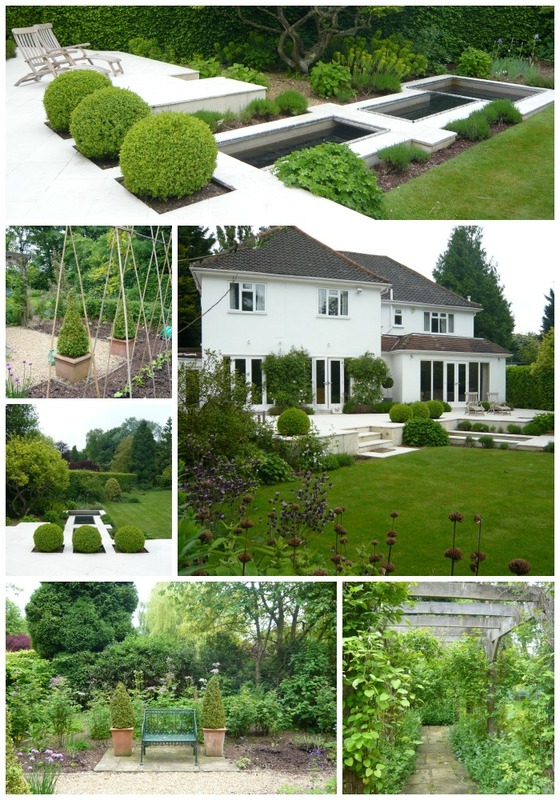 Spiering & Co | 6 Collages of Gardens to Inspire! 6 Collages of Gardens to Inspire! Garden photos generally show one view or angle of a garden, and so rarely capture the essence of the whole garden at a glance. Most of us are pushed for time, and so I thought to capture the essence of a few of the amazing projects we have done over the years for our wonderful clients, in collages. 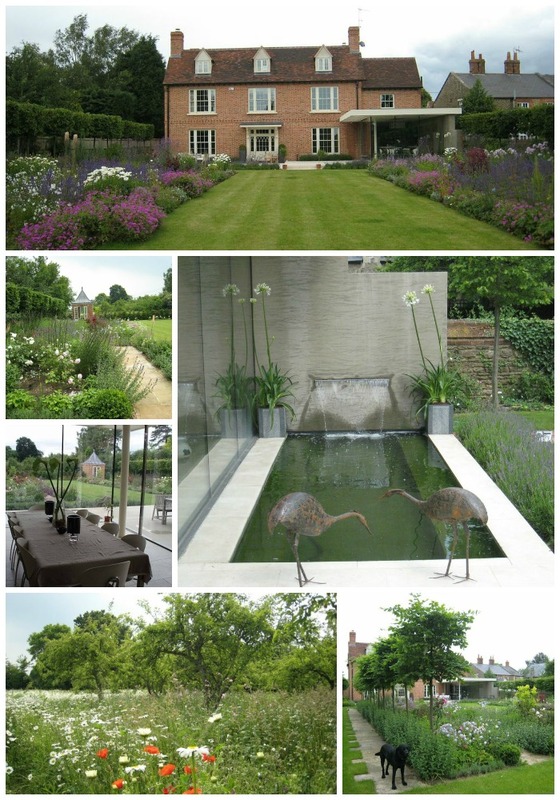 The top garden is a stunning 8 acre garden just outside Oxford, with the enviable setting of a beautiful mansion looking down on to the garden spread out in front of it. The lake looks like it has been there forever, but was part of the redesign of this garden, which is now open to the public under the National Garden Scheme. In the next photo we transformed what was one big building site with the house just being erected when we first came to site, with mounds of rubble and rubbish everywhere, into a well-established garden, open to the public within 18 months of first visiting the site! The clients were amazing people who worked in property and who wanted to create an instant look that they could enjoy with their young family from day 1. 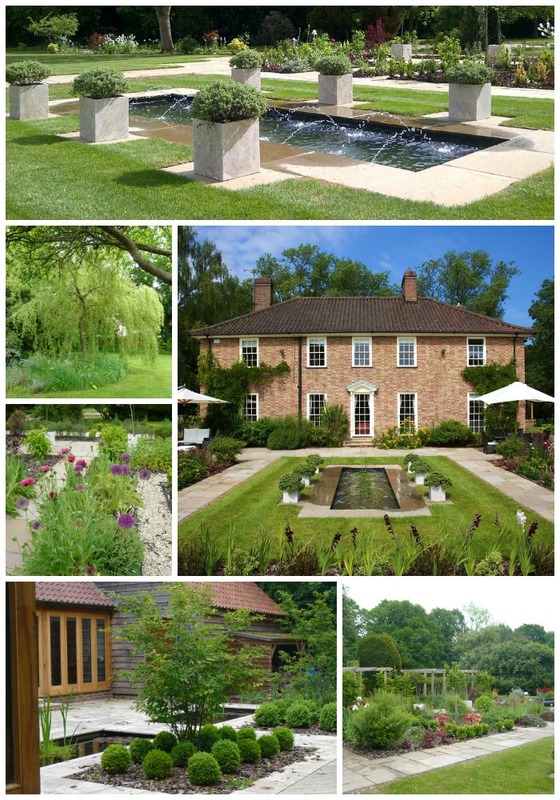 There are borders that you can walk through, a stunning water feature which looks like it’s part of the kitchen when you are sitting inside, and an orchard with a wild flower meadow. 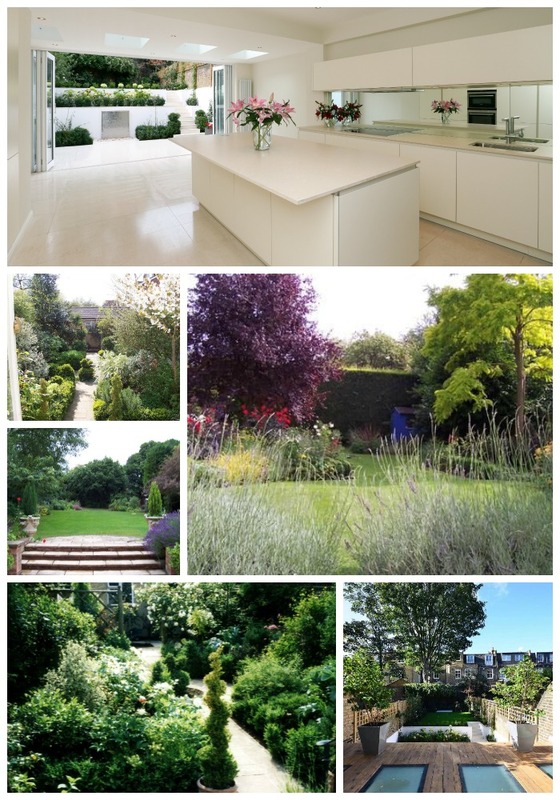 Photo 3 shows a collage of small town gardens, emphasising the importance of a seamless transition from inside to outside. Gardens are not only places of beauty in themselves, they can transform the view and the ambience from within as well. Photo 4 shows a beautiful house set centrally in about an acre of land. 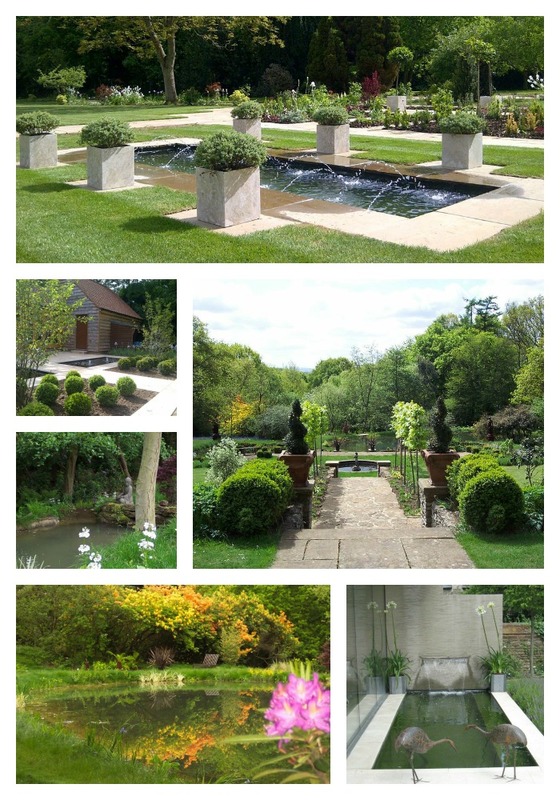 Here we were able to do 2 wonderful water features, one set in a peaceful oasis of a ‘courtyard garden’ to the side of the house, which was viewed from the reading and music room, and one designed centrally in the main back garden which was inspired by the grand water features in the Alhambra in Spain. The garden is designed to bring year round pleasure with lots of different entertainment spaces and an emphasis on abundant flowers and different ‘walks’ to enjoy. The next photo was for a very long, quite narrow garden, so rather than taking the design from the footprint of the house, the garden is set at a 45% angle, which tricks one into thinking it is wider than it is. You may have guessed by now that water plays a big part in many of our designs, so the last collage gathers together some of the many unique water features we have created over the years. The largest lake we designed was for a design in South Africa which had an island in the middle and which was nearly 1 acre wide! The water features showing here however are more to scale with the gardens found locally in the South of England, whether for large country gardens or for small town gardens. Water is the very essence of life, it attracts wild life and birds and bees, and the sound of it is both soothing and musical. Running water is a soft sound, and will even detract from the sound of traffic if you live in the centre of a busy town. Enjoy!